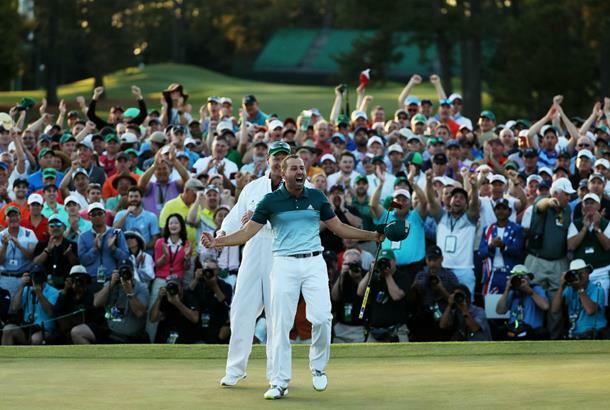 Sergio Garcia claimed his first Major in a dramatic play-off against Justin Rose at Augusta National to win a major at the 74th time of asking on what would have been Seve's 60th birthday. His play at the start of the back nine didn't suggest as much, but the reality is that Garcia held his nerve. In the heat of a Sunday at Augusta, he largely mimicked his fine play over the first three days. Off the tee, for example, he hit 10 of 14 fairways, just one less than on Thursday and Saturday. That saw him tied fifth for the day across the whole field, and only metronome Soren Kjeldsen hit more fairways in the tournament. They were the only two players to hit 80% of fairways or above. He hit it longer too on Sunday, possibly helped by the benign and warmer conditions. Garcia averaged 304.9 yards, his best of the week by nearly 10 yards. Only Koepka, Day, An and Fisher hit it further than him across the tournament. Garcia hit 14 of 18 greens in regulation, just one less than his best-of-the-week 15 on Saturday. He was tied fifth with Justin Rose across the field in Sunday GIR. He was second only to Paul Casey across the week with a 75% success rate. The Spaniard was tied second in that category with...Rose. The duo were significantly different in their scrambling success though. While Garcia was T6 on 66.67%, Rose was down in T38, on 50%. Rory McIlroy, incidentally, was top with a three in four scramble success rate. Garcia avoided a three-putt too, leaving his effort on 16 on Saturday as his only three-putt for the tournament - a massive improvement on recent efforts at Augusta, which included seven of them in one week one year. His much-maligned putting largely stood up to scrutiny in fact. On Sunday, Garcia took 29 putts at 1.61, which translated to 1.71 putts per Green in Regulation. Only on Friday did he putt better than that this week and it saw him in tied 15th in the Average Putts per GIR category across the field, and in 26th position in the Strokes Gained category. A supposed weakness didn't turn out that way - even if he did admit his effort on 16 was "horrible". Putting was the only category Rose comfortably outplayed him in though. The Englishman was T11 in the cumulative Strokes Gained category, and fourth in the average number of putts per GIR. Again, what was not a supposed strength for him turned out to be just that. In the total number of birdies or eagles made since 2012, Rose leads the way on 107. His Masters record has actually been underestimated; four top 10s since 2007 and no missed cuts in that time. Since his debut in 2003 when he was 38th, he has only been outside the top 25 once (36th in 2008). He ought to be established as a serial favourite every April in Georgia. Garcia in contrast has a seriously mixed bag; four missed cuts, but also three top 10s, that slightly belies his supposed anti-Augusta game. On Sunday, the 2nd played so easy - 4.5 to its par of 5 - that a par there felt like a dropped shot. Ditto the 13th, arguably the scene of the turning point in the tournament. The 8th was next followed by the 15th, and if you're spotting a pattern here you'd be correct; they are Augusta National's four par 5s. The 11th (4.377) and the short 4th (3.283) were the toughest holes. The 350-yard 3rd was the third toughest, playing 4.226 to its par of four - proof if any were needed that holes need not be long to test even the great players. How did the rookies fare at Augusta?